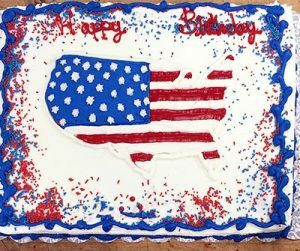 Nino’s celebrates July 4th with food for your picnics and parties! Did you know that Americans celebrate July 4th “Independence Day” every year, commemorating the birth of the United States of America as an independent nation? It was the day the Declaration of Independence was signed by the Continental Congress, rolled up and shipped off to King George VII of England. The 1777 Congress approved. And Fireworks quickly became an Independence Day tradition! But, things got a little crazy in the 1800’s, with citizenry setting off fireworks in city neighborhoods, burning people and buildings. Out in the Wild West, if no fireworks were available, dynamite was sometimes used! City ordinances to hold “safe and sane celebrations” popped up, promoting sports, games and concerts, along with city-run fireworks presentations. And so, we DO celebrate today! With parades and picnics, flying the US flag, the Harbor Freedom Swim, day-long festivals (Laishley & Fishermen’s Village) and many community fireworks presentations! How will you celebrate? Need a To-Go picnic to make celebrating easy? Nino’s can provide subs, wraps and sandwiches made with high quality meats and cheeses, all served on homemade Nino’s breads. How about a Broasted Chicken® dinner or a few pounds of Wings with our sauces. Served with our special baked beans and salads, you’ve got a hearty picnic meal. Give us a call today – we’ll have it ready for you!